Rome means history. The city has much to offer: the arrogant opulence of the Vatican, the top speed of a Fiat Bambino, the timelessness of the Forum, the millions of cats in the Colosseum, trying to cross a major intersection, or the bill for your latte. Enjoy the grandiose thrill of feeling centuries of turbulent history under your feet to the small but potent intoxication of eating chestnut gelati on a hot day. Get your cultural fill but be sure to leave time for more hedonistic concerns: eat till you can eat no more and get drunk on wine, architecture and sunshine. There's layers of the stuff: Etruscan tombs, Republican meeting rooms, imperial temples, early Christian churches, medieval bell towers, Renaissance palaces and baroque basilicas. In this city a phenomenal concentration of history, legend and monuments coexists with an equally phenomenal concentration of people busily going about their everyday life. 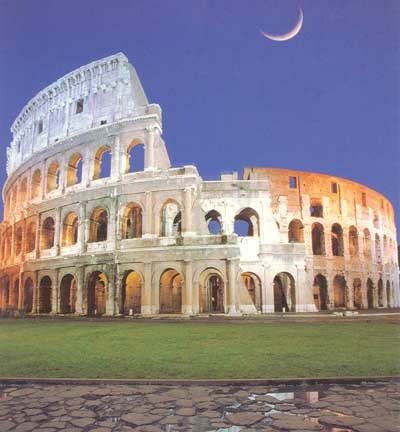 753 BC: 21 April is the legend day that Ancient Romans believed their city had been founded. More recent archaeological discoveries pretty much back this up. According to myth, the city was founded by the twin sons of Mars, god of war, and Rhea Silvia, princess and, until meeting Mars, vestal virgin. The twins, Romulus and Remus, were abandoned on the shores of the Tiber and brought up by a she-wolf. Romulus killed his brother in a battle over who should govern, then established the city of Rome on the Palatino. 510 BC: The non-mythical city was ruled by Etruscan kings until this year, when it became a republic. 2nd century BC: the city controlled central and southern Italy, had defeated the rival empire of Carthage and was poised to take over the whole Mediterranean. But as Rome became more powerful abroad, its citizens got more uppity at home, the city suffered several civil wars, with the last wrapping up on the Ides of March, 44 BC, when Brutus backstabbed Julius Caesar. 44 BC: The Republic ended and the emperors took over, ushering in a frenzy of civic and monumental building. Each emperor wanted to leave his mark on the city and in their eagerness to outdo one another, they sprinkled Rome with many of the famous buildings that still stand today. 98-117 AD: The Empire reached its apogee under Trajan, spanning the area from northern England to Mesopotamia, north to the River Danube and south down the Nile. 4th century: With the rise of Christianity, Rome lost much of its secular power but became the centre of a new empire, Christendom. Many of the city's large basilicas - such as Santa Croce, Santa Maria Maggiore, San Pietro and San Sebastiano - were built around this time. The Bishop of Rome was named successor to Saint Peter. 410: The Barbarian invasions began, but in truth the citizens themselves did more damage, stripping many of the city's fine buildings for their marble. 476: The Western Roman Empire bit the dust when Odoacer deposed Emperor Romulus Augustulus, from this time on power moved east, and Germanic and Byzantine empires bickered over authority over Rome. 8th century: Pope Stephen II backed up the claims of Frankish king Pepin the Short that he was the chosen of God, and in return received a parcel of land around Rome. The alliance became known as the Holy Roman Empire, combining the power of church and state. 9th to the 12th centuries: The papacy splurged its wealth on several new churches dedicated to the Virgin - the Santa Marias of Cosmedin, Trastevere (with its spectacular mosaic), Aracoeli and sopra Minerva. The power of the popes grew, although it was under constant attack from the city's various aristocratic houses. The French Revolution, Napoleon's march across Europe and the Franco-Prussian War pulled the rug out from under papal power. 1870: Rome became capital of the newly united Italy, leaving the pope with mere figurehead status and causing him to abandon the city for the home fires of the Vatican. 20th century: Rome went through yet another growth spurt. The new administration was more interested in offices and housing blocks than churches, and during the 1930s the city expanded beyond the city walls. The pope was made sovereign of Vatican City in 1929. 1920s and '30s: During Mussolini's rule, Rome took on Fascist airs, puffing out its chest with wide boulevards and overblown architecture. Dreams of imperial glory led Mussolini to form an alliance with Germany during WWII, and the nightmare that ensued helped set the scene for Italy's transformation from a totalitarian regime into a republic in 1946. 1960: The postwar years saw Rome expanding physically and becoming the centre of Italy's film industry. 1970s and '80s: These years were marked by more violent transformations, namely those of some radical student groups (who had a long list of complaints about Italy's left-wing governments) into right-wing terrorists. The Brigate Rosse was the most notorious group, going so far as to kidnap and eventually murder former prime minister Aldo Moro in Rome in 1978. 20th century: The last few decades of the saw a mixture of economic success and wide-ranging corruption scandals which touched many a politician, public official and businessperson. 1994: The public reacted with perverse moral indignation by electing a stridently right-wing coalition headed by a billionaire media magnate, Silvio Berlusconi. Amid claims of corruption, the government fell, and after some years of typically Italian political musical chairs, Berlusconi returned from the desert to win the 2001 national elections, promising 'few words and plenty of action'. Despite the landslide victory, his right-wing government's activities have regularly been greeted with large-scale protests. 2002: In December, he was again under suspicion of corruption, but he seems to have a way with the legal system and may just yet again avoid trouble. 2000: The Jubilee Year, during which around 16 million Catholic pilgrims visited the city, gave Rome impetus to clean up her act. At the start of the new millennium Rome had never looked more beautiful. Meanwhile, Rome proper ostensibly remains, as it has always been, an administrative and tourist centre, without much sign of industry or trade, but lots of political intrigue.Billions were spent cleaning church and palazzo facades, improving roads and transport, and reclaiming public spaces from the car parks they'd become.